It’s the bottom of the ninth. The lead is down to one run, and the bases are loaded. Up to bat for the Los Angeles Angels is Albert Pujols, a future Hall of Fame slugger and one of the highest-paid players in baseball. All he needs is a hit to tie or bring in the go-ahead run on second for a walk-off victory over the New York Yankees. Pujols is paid to hit a grand slam in this very situation. So who do you want on the mound facing him? 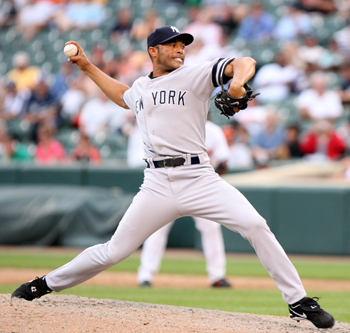 There is only one answer: Mariano Rivera. Rivera is the best closing pitcher in baseball today, maybe of all time. Even in the storied Yankees -- a franchise with a history of great pitchers like Lefty Gomez and Whitey Ford and all-around legends such as DiMaggio, Ruth, Gehrig and Berra -- Rivera stands out. The secret is a single pitch -- the cut fastball, or cutter. It flies fast and straight on release but at the plate cuts up, down or sideways. Thrown around 90 mph, it leaves hitters barely any time to react. And when they do get a piece of it, their bats often break. So when Rivera comes into the last inning of a game to close out a Yankee lead, it is a rare game that is not effectively over. And that’s what happened last month on the road against the Angels when he struck out Pujols. As an ardent Yankees fan (is there any other kind? ), I have long admired Rivera for his extraordinary athletic ability, humility and basic human decency. But it is as a theologian and scholar who studies and writes about global transnational Christianity that I am most inspired and impressed by Rivera. The cutter, it turns out, is not Rivera’s only or most powerful secret. As well as being an ace pitcher, Rivera is also a Pentecostal Christian, one who carries his faith quietly, never wearing it on his sleeve (though “Phil. 4:13” is discreetly embroidered on his cleats and pitching glove). Regardless of denominational ties -- or baseball allegiance -- all Christians should be interested in Rivera. He is part of a theologically rich movement that is transforming the church today. Some New Yorkers -- and perhaps even a few Yankees fans -- first learned of Rivera’s Christianity, or at least the depth and richness of his faith, only last month, when he was the subject of a New York magazine cover story, headlined “Pitching God.” Written by former Newsweek editor and religion writer Lisa Miller, the profile, entitled “Saved,” presents a moving portrait of Rivera’s life of faith, its sincerity and humility. Even for those who have no interest in baseball, Miller’s story is a fascinating look at how Rivera understands his craft, and how he sees faith and ministry working together in a seamless whole. In both his baseball and his theology, Rivera offers lessons for all Christians. “Everything I have and everything I became is because of the strength of the Lord, and through him I have accomplished everything,” Rivera told Miller. But, he told Miller, these gifts are not without responsibility. “The fact that his gifts come from God increases his obligation to honor them with the hard work and discipline for which he is famous,” Miller reports. “From earliest times,” Moltmann wrote, “the charismatic experience of the Holy Spirit has been pictured as a flowing, an outpouring and a shining.” It is a “vitalizing energy” that flows from the presence of God. To borrow from Moltmann’s imagery, Rivera might see himself as a closer in the Spirit, his gift an energy flowing from the presence of God. But that energy, that Spirit, is not limited to Rivera’s arm. In many ways, Rivera, a native of Panama, represents an outpouring of the Spirit in New York, one that goes largely unnoticed and unseen by most Americans. He is a better-paid version of the thousands from around the world who come to New York to make a better life, bringing with them their gifts and skills -- and vibrant forms of Christianity. In New York, faith is percolating up across the five boroughs and metropolitan region, a faith of “vitalizing energy.” Latino Pentecostals like Rivera play a major role in this explosion of religious life, with more than 1,000 congregations in the city of New York alone. Mission for these congregations is based in the local church, as is leadership and vision. Drawing from the living experience of God, expansion continues in some of the most overlooked parts of the city. In fact, it’s hard to get off a subway stop in Brooklyn, Queens or the Bronx and not see an Iglesia Pentecostal de Jesus Cristo. Latino Catholics, of course, have long been prominent in the city’s religious life, and even today the Catholic Church remains a vital presence, fueled by diverse streams of immigrants from Latin America. But Pentecostalism is increasingly a major part of the urban fabric in New York and around the world. Just as Pentecostalism in the city is diverse, so is Latino Pentecostalism. Some congregations worship in Spanish only, while others are bilingual in their worship and ministry. Congregations also differ in doctrine and dress. What they have in common, observes Jonathan Roque, the bishop of the Council of Damascus Christian Churches, is a strong commitment to community and family. While some Latino Pentecostal churches are more holistic in ministry than others, all have their scriptural imagination shaped by the liberating power of Jesus. As a result, as Daniel Rodriguez highlights in his important study “A Future for the Latino Church: Models for Multilingual, Multigenerational Hispanic Congregations,” new and exciting paradigms of church life and ministry are emerging. Transitions are part of ministry and of baseball -- and of this time and moment in New York and America. Rivera is the rare person who is actively experiencing the transitions in all these areas. Illustrating the diverse worlds in which he lives, New York magazine photographed him in his Yankees uniform reverently holding a well-worn copy of the Bible. Not surprisingly, when he retires from baseball at the end of this season, Rivera plans to focus on church and ministry. According to the magazine article and other news reports, Rivera is renovating a long-vacant Presbyterian church building in New Rochelle to house a Refugio de Esperanza (Refuge of Hope) congregation, to be led by his wife, Clara Rivera. The model of the church will be a ministry of the heart as well as of deed in the community. It may not be the bottom of the ninth for the church in the United States (though some might argue that it is getting late in the game), but Rivera and Christians like him are who we want on the mound and in the game. They offer hope for a church that at times seems to be facing long odds. But here, too, Rivera has much to teach us. He knows about coming back against the odds. Last year, Rivera stumbled during warm-ups and tore his ACL, a knee injury that at any age might have been career-ending. This year, of course, he’s back having one of his best seasons ever. So if you get a chance to see Rivera pitch this summer, thank the Holy Spirit. That is, unless you are with the Angels. Or, of course, the Red Sox. Faith & Leadership Editor’s Note: Yankees fan Peter Gornik, 12, provided editorial assistance to his father in the writing of this essay. Reprinted with permission by "Faith & Leadership" www.faithandleadership.com. The views and opinions expressed in this commentary are those of the author and do not necessarily reflect the official policy or position of the Florida Conference of The United Methodist Church. The "Conversations" editor is a fan of the Atlanta Braves.